After several lots of experimentation, the ‘Judith and Tim Hochzeit Kuchen’ recipe is finished! I apologise for my German if it is incorrect! I haven’t actually made the entire recipe at one time as the deadline has crept up but the individual components have been made and I have tasted it in my head! Heat oven to 180oC. Whisk the butter and sugar in a large bowl until light and fluffy. Add all the other ingredients and mix until blended but not separated. Divide among the 3 tins, level off the top and have a slight depression in the centre. Bake for about 20-25minutes until springy and slightly shrink away from the sides of the tin. Cool in the tins for 5minutes before turning out onto a wire rack and leaving to go completely cold. Put the ingredients in a small pan, heat gently until the sugar is dissolved then boil for 1minute. Leave to cool completely. Put all the ingredients into a medium sized pan, set over a medium heat and stir until the sugar dissolves in the juices. Then rapidly boil for 2 minutes, stirring until thick. Allow to go completely cold. Put all the ingredients in a bowl and beat until light and fluffy. Refrigerate for a couple of hours before using to cover the cake. 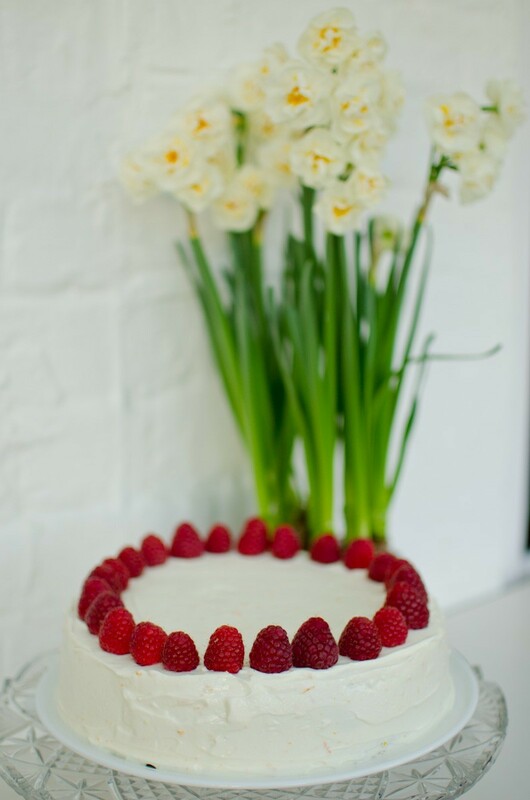 Using a pastry brush liberally soak two tiers of the cake on the top surface and one tier on the bottom surface. 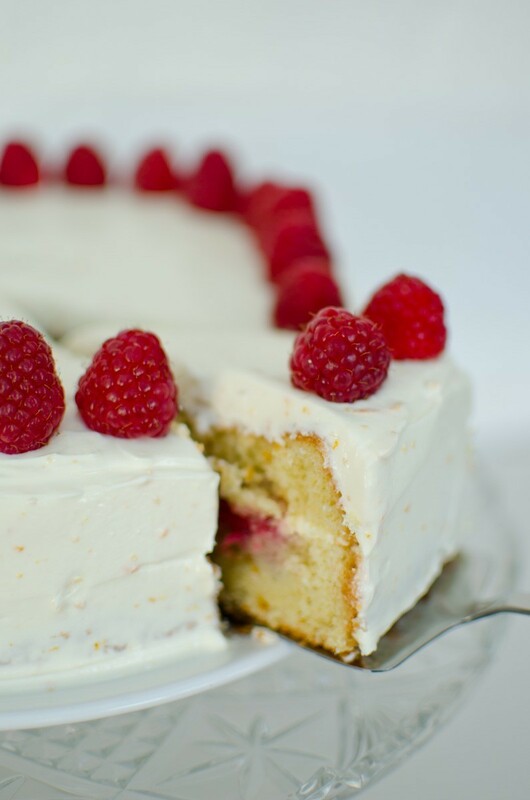 Place a cake layer on your serving plate of choice, syrup side up, spread over one half the raspberry filling, place on the next layer of cake syrup side up and spread on the remaining raspberry filling, place on the last tier with the syrup side down. 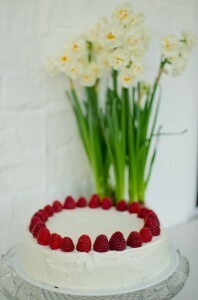 Cover with the mascarpone frosting (or other frosting of choice) and decorate with fresh raspberries. Refrigerate until needed but ideally eat the same day it is made.